Aakenustunturi fell is in western Lapland, between villages Kittilä and Äkäslompolo, in Pallas-Yllästunturi national park. It has several tops and its shape is quite curved, like a kidney. I made a day hike in mid September starting from lake Pyhäjärvi at the foot of the fell. There is a lean-to and laplander’s hut, kota in Finnish at the northern point of the lake. Following the trail to the top of the fell there is a new laplander’s hut, Vareskota beside the lake and at the southern end of the lake a wilderness hut and two lean-to’s. Another popular starting point is Totovaara parking place south of Aakenus fell. The weather was after four days of mist and rain better and all surrounding fells were quite well visible. The route from lake Pyhäjärvi is varied from forest trails to quite rocky paths at times where you should really watch your step. I hiked to the first top and back. You can hike to the top and along the ridge of Aakenus to the other point of the fell and then come back by trails at the foot of the fell. That would make a good over 25 kilometers long route which is better done in two days because of quite demanding terrain. Kätkätunturi fell is in Kittilä, close to Levi resort. I made a day hike to the top last week in mid September. The weather was a bit rainy and moist and visibility only a few tens of meters. There were no views from the top but mist brought colors and landscape out in quite a fine way. Autumn colors on trees were almost gone already but colors on the ground were not still in full bloom. The yearly “ruska” autumn colors season was going on, there were quite many people on trails and at the fire site on the top. Quite many hikers were using nordic walking poles which come very handy especially on the steep ascend from the top. There are many trails around and to the top of the fell. Some of the trails are suitable for biking. You can hike or bike from Kätkä fell to other fells nearby, or to Pallas-Yllästunturi national park which is about 10 kilometers away. You can enter the southern part of Nuuksio national park from Siikajärvi. Behind Siikaranta conference hotel is a parking place if you arrive by car. From Siikaranta to the nearest fire site of lake Holma-Saarijärvi is about 3 kilometers by main paths. From Holma-Saarijärvi you can continue to lake Mustalampi via Korpinkierros circle trail and come back to Siikajärvi. At Holma-Saarijärvi there are two fire sites, one on an island and one at the lean-to. At weekends you will have company at fire sites. There was plenty of wood at the time I visited. One not so nice souvenir of Nuuksio in September is a deer fly, hirvikärpänen in Finnish which is one nasty insect that likes to stick to your hair and most persistent ones you will find at home. In September weekends there are quite many people, quite many picking mushrooms. If you exit main trails to less used paths which are plenty, there will be no rush. 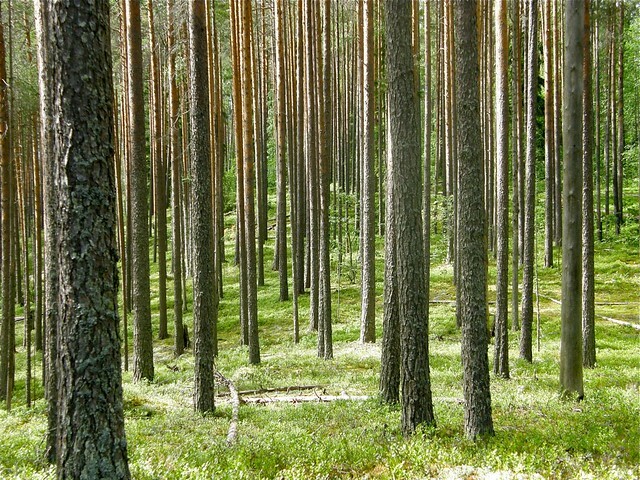 Since mushroom pickers use no trails they will blend in in the forest. Störsvik nature area is about 40 kilometers west from Helsinki at the seashore. 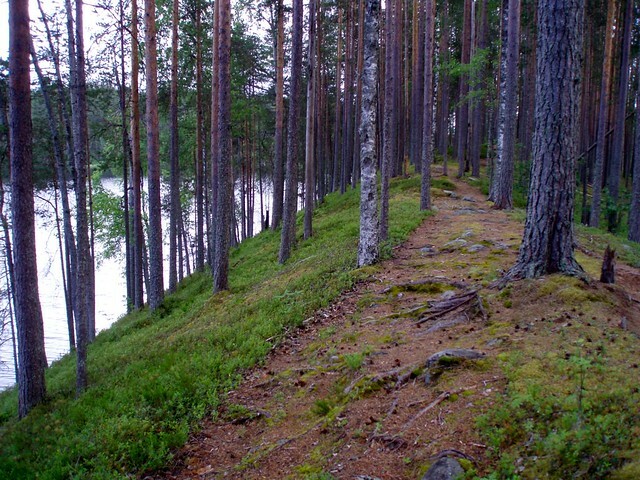 With nearby Kopparnäs area it is great hiking area for day trips or even camping a couple of days. The area has beautiful shores, cliffs and varying nature. To visit Störsvik you can enter the area through Pickala, past golf course and park at the new parking place near Kolaviken and then follow the trail by the shore. That leads you to Sandviken’s beautiful sand beaches. The trail is not much used. The other trail leaves near the golf course, goes straight to the beach and is easier and shorter. You can also walk from Kopparnäs area using trail by the shore. At the Sandfjärden bay there is a covered fire place and a smaller beach. Later I heard that there used to be a camping ground in Sandfjärden, luckily it is nowadays peaceful recreation area with no masses of people. Petkeljärvi national park is the most eastern national park in Finland near Russian border. It is a small park and suitable for day trips. Starting point for hiking and canoeing is in Petraniemi Outdoors Center where your can rent canoes and buy fishing permits, camp or stay at the lodge. There are great small waters and bays you can reach from Petraniemi either by canoe or kayak. If going south by paddling beware not to enter border area, it is only 3 kilometres south-east from the park. Heading south you can paddle all the way to Mutalahti which is 20 kilometres away in south. If you want to kayak longer trips you can paddle north towards lake Nuorajärvi and further to Koitajoki river. Paddling through meandering Koitajoki you end to lake Koitere. Before setting up this real wilderness paddling, remember that Koitajoki river is over 200 kilometres long. 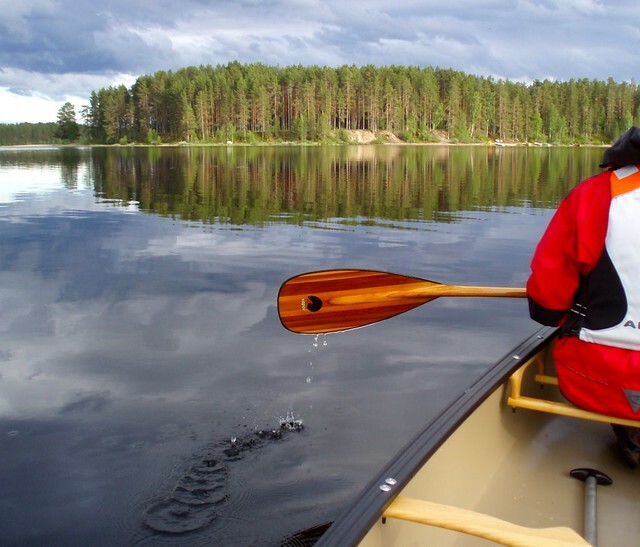 The lake area near Petkeljärvi and Ilomantsi is great for paddlers. Try paddling at night in June, it does not get dark at all, just a beautiful dusk and peace. At dawn you will probably see and hear nature at it’s best. You will most likely see and hear Black-throated diver when walking along Korkeasärkkä ridge to the tip of the peninsula and back. Another good starting point for paddling trips is near Ilomantsi, from Ruhkaranta beach. Nearby are good paddling places and beautiful ridge area along Taitajan Taival hiking trail. In 2010 I had a joy of visiting a lot of interesting places, some of them familiar before, some totally new. The visits to some places were one time only, some I visited more than once, one almost daily. The visits lasted from daily short walks to a few days canoeing trip. I enjoyed them was by walking, biking, cross country skiing, kayaking and canoeing. There were a lot of other fine and memorable places I had a chance to see in 2011. These five I picked because each of these left me with great lasting memories. The day trip to Riisitunturi National Park in March was done in perfect weather, sunshine and crisp -10C cold. Riisitunturi fell is quite a winter wonderland, with ice and snow “tykky” covered spruce, great views to lake Kitka and slopes with really deep snow. We entered the park from Riisitunturi starting point. From there you can either ski to the wilderness hut beside the fell. Or if you are with snowshoes, go first to the top of the fell along the route called Riisin Rääpäsy and then to the hut. If not following the maintained ski tracks for other starting point in Tolva village, you might be better off with wider skis, like forest skis. Going down from the fell with skis is marvellous, you can make your own tracks anywhere in the park. In March snow is quite deep and surface is not yet turned into ice, so called “hankikanto”. There is a chance or great telemarking down the hill off the trails in case you do no mind sinking into armpit-deep snow where your poles do not reach the bottom. Absolutely a lovely place worth visiting if you are around Posio, Lapland or Kuusamo. For more information see nationalparks.fi. 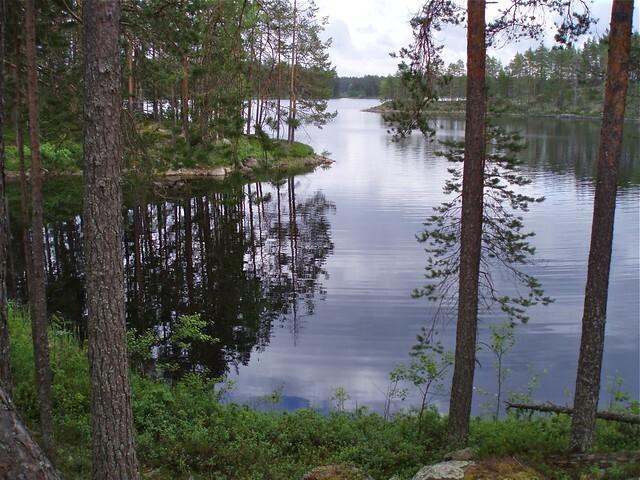 Lake Pihlajavesi is part of greater lake Saimaa. Pihlajavesi is full of islands and protected areas, a paradise for a kayaker or canoeist. My trip in July by a canoe was around island called Kongonsaari. It was very hot in July, so hot that canoeing at midday was not a good option. Canoeing was therefore done early in the morning. Horseflies were abound and very hungry. Swimming was the only reasonable thing to do, several times during the day. Kongonsaari Island has a few tent sites and harbours which are favoured also by boaters. To find more peaceful shores in Pihlajavesi I advise to have a look of the harbour information site and then choose those with fewer stars, no docks for boats and shores with shallow water. For those interested to see Saimaa ringed seal (Phoca hispida saimensis) which inhabits in lake Pihlajavesi, this is the place to spot it. One evening a fellow camper got a glimpse of it in the waters near our tent site but still after patient wait it did not appear again. Helsinki offers fine conditions for sea kayaking. There are some private tour operators and kayak rentals but most natives leave for their trips from their local kayak clubs. Last summer and fall I did some evening trips along the shores of Helsinki. Photographing from the kayak in the evening is quite challenging as you can see. The urban surroundings in the evening make kayaking quite unusual experience. Going through West Harbour beside those huge sea ferries makes you feel very very tiny and hope that those floating houses are not right now leaving the harbour (check their schedules). Entering Ruoholahti Channel with reflecting lights is very interesting (see picture above), gives you a new perpective of Helsinki. Anyway, it is wise to go with a group as the boat traffic near Helsinki is quite busy, especially in daytime. In the evening you must have good lights to give other boaters some mark of your existence. Pihlajasaari is an very popular island nearby and to get there by kayak you have to cross very busy and many crossing boat routes. At the same time you have to be aware of those big ferries coming and going and sometimes quite rough sea. There are many other great islands and spots, some equipped with fire places and on some camping is allowed. See for more information on Helsinki and Espoo archipelago. 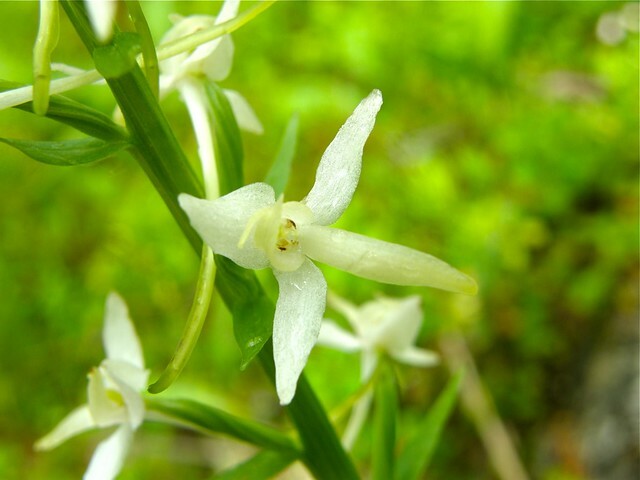 Vaarunvuori is a jewel in the middle of Finland, a protected area near lake Päijänne, high on the steep cliff. There is a varying nature trail of 4 km which goes past two lakes and the cliff called Vaarunjyrkkä. It is a nice place for a day trip either from above the hill via nature trail or from lake Päijänne below. There are no tent site but one fire place along the trail. There are plenty of berries (blueberries, cranberries, cloudberries) and mushroom to choose from if you know right places.. It is also the most valuable area of middle Finland with over 60 endangered species. Luckily the plans for power plant were stopped in the 90’s by Vaarunvuori movement. Shores of Helsinki are along my almost daily walking routes. The seashore is always different depending of the light, wind, weather etc. There is always something interesting to photograph. The sudden encounters with a city fox, rabbits and spotting of variety of birds gives an unexpected nature to each walk. The nature is not really that far away anywhere in Helsinki. In summer you can bike along the shores or on other 750 kilometres of bike paths. Helsinki is almost surrounded by sea, the coastline is of 122 km long, so there is plenty to explore. Happy New Year 2019! Hyvää uutta vuotta 2019!